Pigeons! A tameable mob with a purpose! You'll "dove" what I've added! Poll: Do you like the perch? Poll: Do you think I should reorganize the thread. Also, please stop giving fixes for a lag issue that has been fixed for half a year. We don't really need it any more, and it's getting quite annoying. If there is still a lag issue that I haven't stated, then please alert me of it. Isn't it hard walking over 1000 blocks just to deliver a single item? Yes you can make rail systems to send large amounts of items, but I find a simpler way is necessary. My answer: Delivery Pigeons. It would be able to fly (follow), or stand (sit), until you are ready. When you want to send something, shift+right click the tame pigeon, and this GUI will come up. The 6 slots are for the items that you want to send, the send button sends the items, the cancel button exits the menu without sending, and the black box is for the players name. I decided on 6 slots, so that clever rail systems are not obsolete. A new block would also be added called the perch, when a pigeon is sent, it will land on one of the receiving player's perches. I'm clueless about redstone, but I think that If a pigeon is on a perch, a comparator could give off a signal, but not if the perch is empty. You could create pigeon alarms using this. Please tell me if this is not how comparators work! Preches can be named for 0 xp in an anvil, so you can type: "playername perchname" to decide exactly which perch you will send the pigeon to, without too much expense. Adventure map makers can use commands to give perches custom names, without having the playername. This is so that you don't have to send messages to the author of the map to complete a puzzle. If the player you are sending the items to does not have enough perches, the pigeon will just put the items back in your inventory (Or on the ground if there is not enough space). When you send a pigeon to a user, It will appear to fly away, but when it reaches an unloaded chunks, it will teleport to one of their perches, with a delay depending on distance between the 2 objects, the blocks:minutes ratio would be about 500:1. If the distance is shorter than 200 blocks, It will just fly the distance (and load any unloaded chunks). This is so that on small map PVP servers, and UHC's you can have fun shooting down enemy pigeons. It would be hard to do this, as they fly twice as fast as a player sprinting. It will then appear in the "view" any nearby players, and land on it. If no players are nearby, it will just be sitting there. 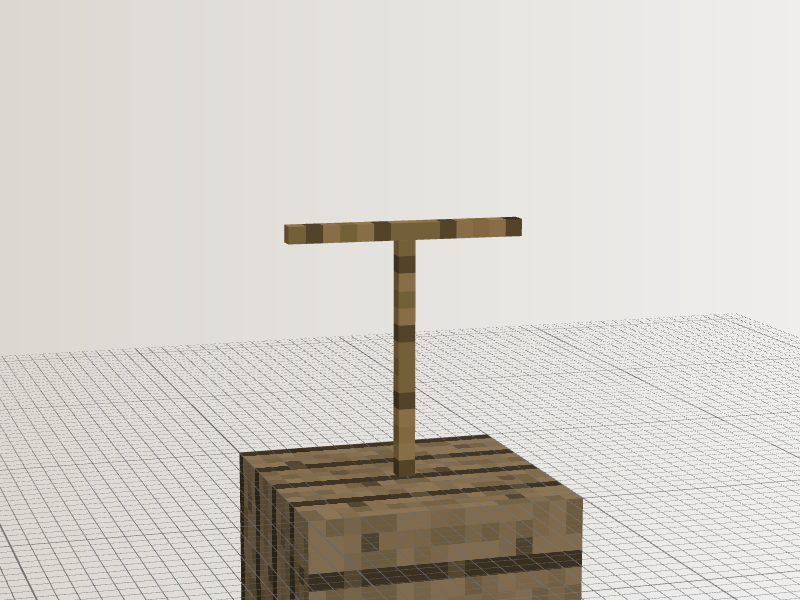 If it can't reach a perch in any way, it will noclip through the layer of blocks, I cant see how this could be used for griefing. Once the player has found it, and taken the items, it becomes that players pigeon. Only the owners of pigeons can use their inventories. I'm sure you can see how this can help in multiplayer, but what about the people who are strictly singleplayer? I've sorted this too. You obviously could just have a pigeon follower, or a pigeon farm just for the fun of it. And there's the potential for minigames/ puzzles. Try an shoot down pigeons before they get to you, or have to send items in pigeons to complete the puzzle... The possibilities are huge. 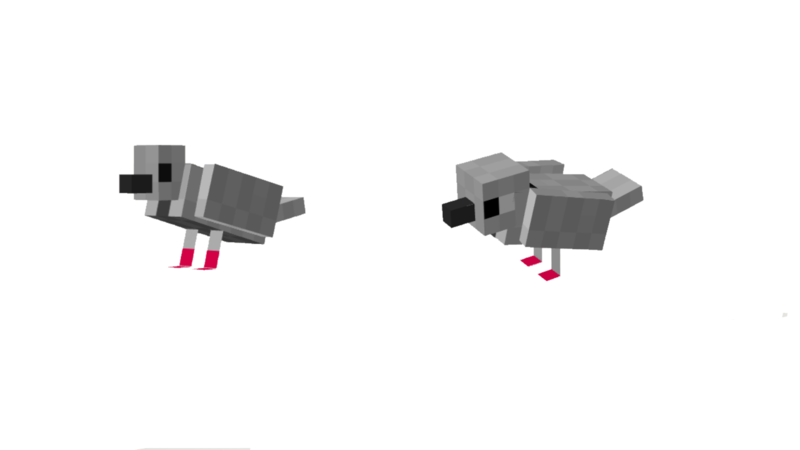 Since previous tamable mobs like horses, and cats have multiple skins, pigeons would have a chance to spawn with dove colours. ThesaurusRex and I worked on creating a more realistic pigeon, that would still fit the game. It has a larger tail, chicken eyes, and a smaller head. The legs are also different. Reddit user coolreader18 (and a few other people) suggested letters. Crafted with one paper, and one feather, they store a single page of writing, and make a good aesthetic, and are a cheaper way of sending text. "I don't like the trees, No Support." So that I can improve the suggestion. Thanks to Mart_b77 for this next one. If you want to make a mod of this, there is no need to ask, but you MUST, tell me about the mod. so the pigeon loads chunks? So if I were to send out hundreds of them in all different types of directions at massive distances. As the pigeons load chunks, the computer/server has to keep track of all of these chunks. Pretty soon, you will have a crash due to the fact that nearly 100% of the processing power is being used to render everything and keep track of mobs that are thousands of chunks away. In short, I don't like this because it would have ways to crash servers, and under these circumstances, they wont despawn and it will be a cycle of sadness. I reject your reality, and substitute Minecraft! But how many people on an average survival server will you want to send messages to? They could just teleport, but I want it to take time, rather that being instant. 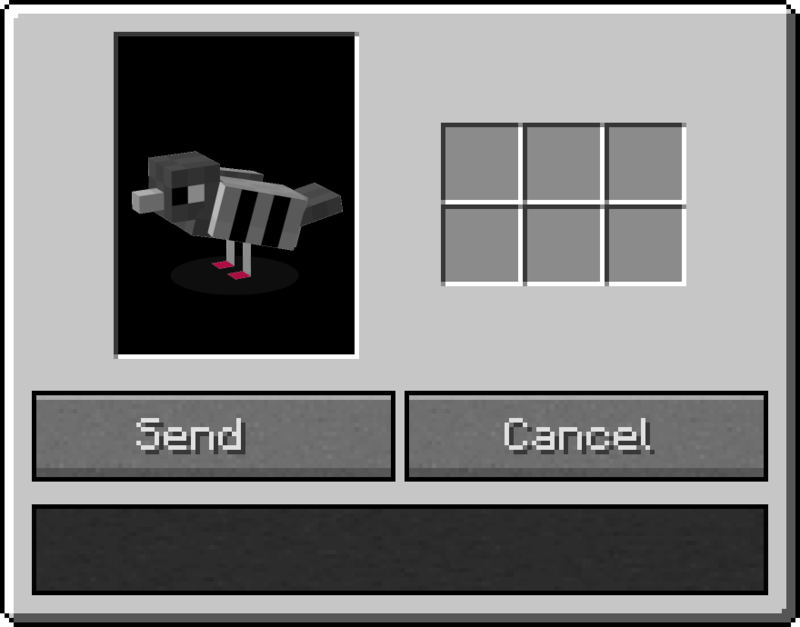 The pigeons would be in a modified spectator mode, that can touch blocks, and entities, but not spawn mobs. If anyone can think of a work around, other than delayed teleporting, which would be annoying, then please suggest it. About them never despawning. Maybe pigeons could have 3-5 uses or something. lets say for the sake of why it is bad to have pigeons that fly, that I get five friends and send them a million blocks away (actually not unreasonable, ive walked that before). I then send a pigeon to each one. Each pigeon must load approximately 62500 chunks to get there. that is about 4,096,000,000 blocks for one pigeon. now remember, there are five of these such pigeons, so the total blocks loaded are 204,800,000,000. if you were to convert these blocks into their meter counterparts, the length of such a line of that number of blocks would go around the earth 4,915.2 times, and be able to go all the way to the sun and half way back. THATS ALOT OF BLOCKS! so, teleportation would obviously solve this. but once you do that, the uses for this are relatively limited, as in most survival servers you can tpa someone and just give them the items. Agreed, that's why I need suggestions. I'll add the fact that I need ideas to the OP. Also on the servers I play on, there is no teleporting. Perhaps it would work using teleportation, but there would be a delay between the time the pigeon is set to the time the pigeon reaches it's destination. That would solve the problem of loading too many chunks and causing server crashes. I guess that would work, but there would be no difference in delay between long and short distances without loading all the chunks, from what I have heard. The reason I don't want them to teleport instantaneously, is because I want it to take time to send items, but for now It's the best idea there is. Press t and type in what you went to say, press enter. Cubic Chunks just lessens the strain of this, it doesn't fix the problem. Plus suggesting things that rely on other suggestions is generally just a bad idea. If the main idea doesn't get in, the idea based on it won't either. Congratulations, you completely missed the point. This isn't for sending chat messages, it is for sending messages that are like packages that contain items. As for the problem at hand, that is easy. Say you have 2 players. Player 1 is at the coordinates 0, 0. Player 2 is at coordinates 0, 10000. 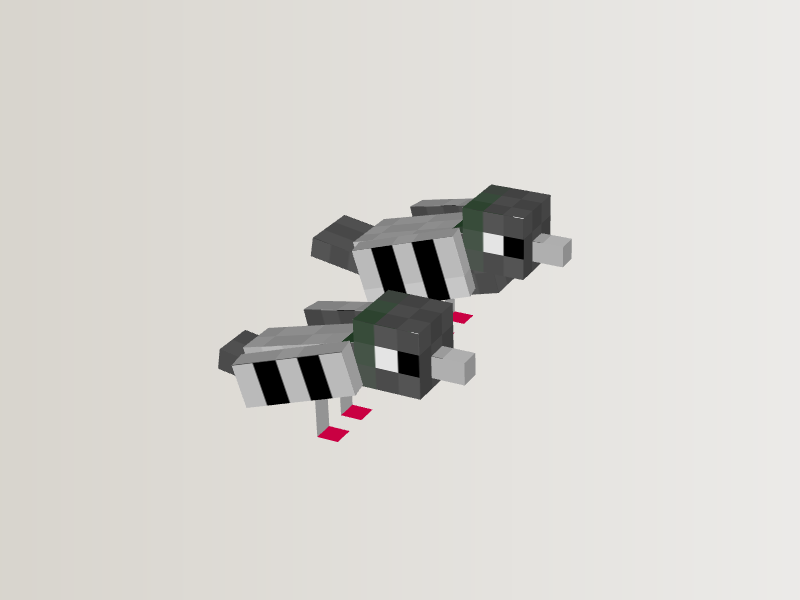 Just for the purpose of this example, lets say the Pigeon flies at 10 blocks per second when delivering something. When Player 1 chooses to send an item to Player 2, it does some quick calculations. Player 2 is 10000 blocks away and the Pigeon moves at 10 blocks per second, so it should take the Pigeon 1000 seconds to get to Player 2 (or 16.66 minutes). So as soon as the Pigeon is sent, the game sets a timer for that long. The pigeon will fly towards Player 2, but once it is out of sight from Player 1 (something like 32 blocks away), it disappears. After the timer hits 0 seconds, the Pigeon spawns near Player 2 and flies near him. Player 2 activates the Pigeon, receives the item, and the Pigeon flies back to Player 1. If Player 2 is not logged in when the timer hits 0, the Pigeon will appear as soon as he logs in and follows him until he activates it. That way, it creates the illusion that the Pigeon actually flew there, but with no chunk loading. And for game balance sake, you could put a maximum limit on the timer. I would say around 10-20 minutes maximum. It may not be realistic for 100,000 block trips, but nobody would want to wait for hours for 6 items. As people said, you could have a timer on it. Like, each 1000 blocks is 1 second. So if a player is 50,000 blocks away, then the pigeon waits 50 seconds before teleporting to the other player. Interesting idea, i like the models also, but i don't even know if this is possible? until i know for sure ill give it. ok that is a really good point and i hope this is implemented, maybe there could also be something to store the pigeons, such as a bird cage, so you can keep track of them, ensure they wont wander off. Full support! Cubic Chunks just lessens the strain of this, it doesn't fix the problem. Plus suggesting things that rely on other suggestions is generally just a bad idea. If the main idea doesn't get in, the idea based on it won't either. Congratulations, you completely missed the point. This isn't for sending chat messages, it is for sending messages that are like packages that contain items. As for the problem at hand, that is easy. Say you have 2 players. Player 1 is at the coordinates 0, 0. Player 2 is at coordinates 0, 10000. 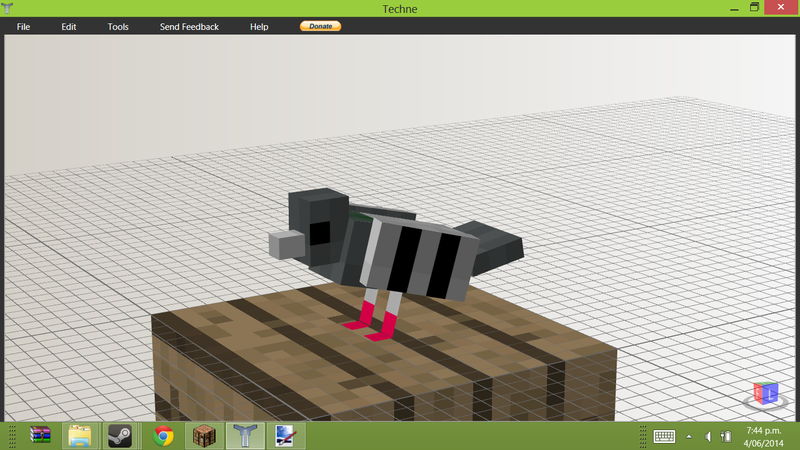 Just for the purpose of this example, lets say the Pigeon flies at 10 blocks per second when delivering something. When Player 1 chooses to send an item to Player 2, it does some quick calculations. Player 2 is 10000 blocks away and the Pigeon moves at 10 blocks per second, so it should take the Pigeon 1000 seconds to get to Player 2 (or 16.66 minutes). So as soon as the Pigeon is sent, the game sets a timer for that long. The pigeon will fly towards Player 2, but once it is out of sight from Player 1 (something like 32 blocks away), it disappears. After the timer hits 0 seconds, the Pigeon spawns near Player 2 and flies near him. Player 2 activates the Pigeon, receives the item, and the Pigeon flies back to Player 1. If Player 2 is not logged in when the timer hits 0, the Pigeon will appear as soon as he logs in and follows him until he activates it. That way, it creates the illusion that the Pigeon actually flew there, but with no chunk loading. And for game balance sake, you could put a maximum limit on the timer. I would say around 10-20 minutes maximum. It may not be realistic for 100,000 block trips, but nobody would want to wait for hours for 6 items. Looks pretty interesting. About your discussion about the pigeon and load of chinks it flies over. Yes that would be a petty big problem I would suggest that the pigeon flies up and after a bigger distance disappears and then later when some time passes (depending on the distance it has to travel) appears from the sky. Well I don't totally knew about the idea maybe maybe not o_O ? Previously, I was being stupid, and not thinking of the obvious way that it could calculate distance, without loading blocks. Now I have a simple answer. Editing the op now. Interesting idea, i like the models also, but i don't even know if this is possible? until i know for sure ill give it Partial support. 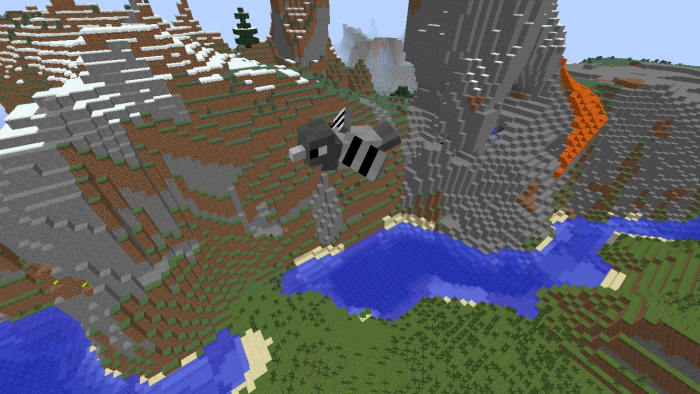 Well bats can fly, donkeys can store items, and wolves can teleport to players. Nice idea. I want to see that and there should be limit on how many you send but horse can store things but they can,t message other user on minecraft. They can only store. What? Pigeons can't actually send text. Only in the form of books. Partial support. Mabye make them only load the chunk the other player is. So basically they would just do a slow teleport to the other chunk. Can't people just kill it?When its flying can someone get a bow and shoot it?